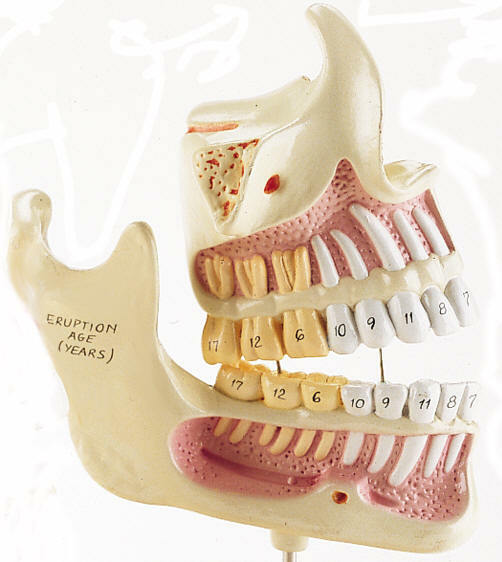 Upper and lower jaw opened to show the arrangement of the remaining teeth in this milk dentures model. The milk dentures model comes with base. Adult dentures with Tooth roots, spongiosa, vessels, and nerves exposed. 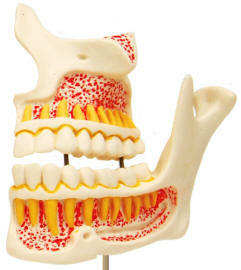 The lower jaw is movable on the adult denture model. Comes on base. Cast from natural specimens, a series of 4 upper and lower jaw halves show four different stages of dental development: newborn, 5-year-old child, 9-year-old child and young adult. 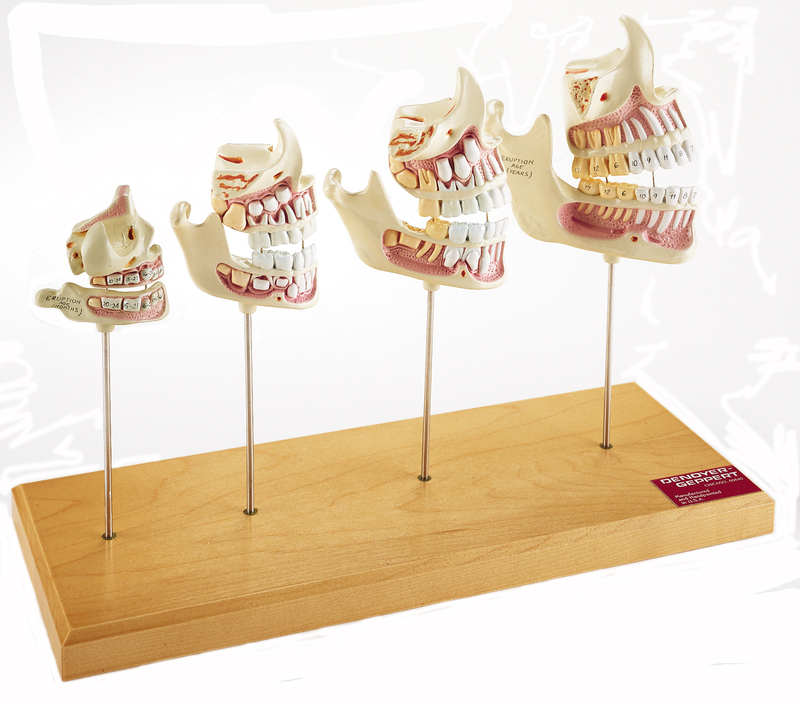 Four life-size unbreakable plastic models, mounted on a single hardwood base, traces the development of human jaws and teeth from birth through adulthood. 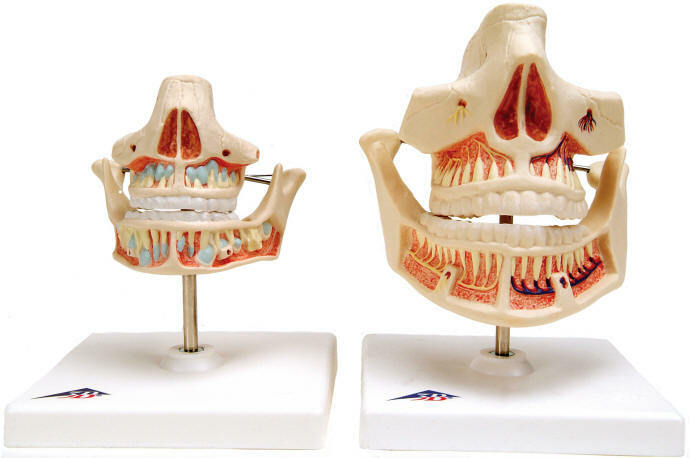 Each model depicts the right half of the maxilla and mandible cut open to expose the roots of the teeth and developing teeth with the jaws. 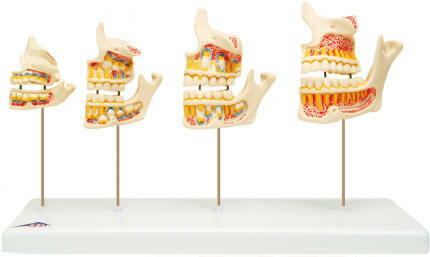 Color coded to identify deciduous, successional and superadded permanent teeth, this series includes jaws of newborn, 5-year-old, 9-year-old and adult. Overall dimension 9 x 18 x 4 inches.